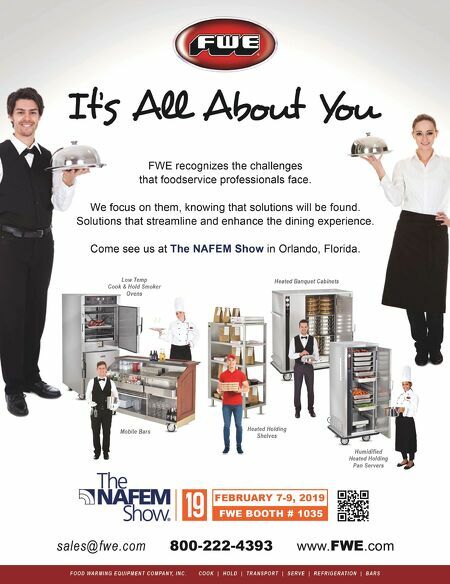 52 • FOODSERVICE EQUIPMENT & SUPPLIES • FEBRUARY 2019 ith the challenges facing casual dining, many operators in the space try to offer their guests not just food but an experience — something to remember that makes the time, money and effort of visiting a full-service restaurant worthwhile. These efforts, though, often boil down to elevated finishes, especially in the bar, along with a few extra seating options. Offering a genuine experience has never been a challenge for Tampa, Fla.-based The Melting Pot. How could a restau- rant offering meals starring shared cheese and chocolate dips not deliver an experience? But with a new prototype rolled out last year paired with new menu options, the chain now offers something different. More than a restaurant for special occasions, The Melting Pot now offers new experiences created a bit by the design itself, alongside dining and seating alternatives for consumers who aren't out to turn a meal into an event and even some to-go options. 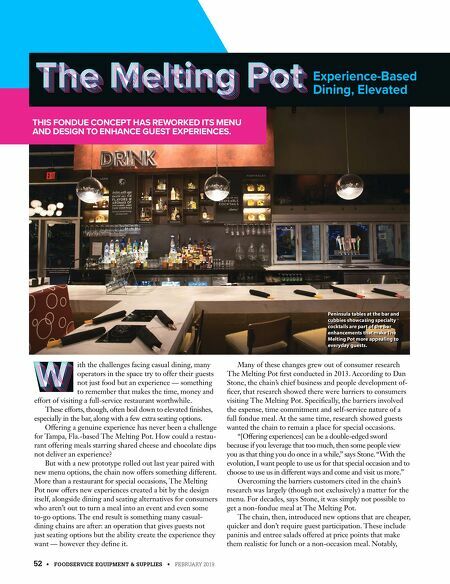 The end result is something many casual- dining chains are after: an operation that gives guests not just seating options but the ability create the experience they want — however they define it. Many of these changes grew out of consumer research The Melting Pot first conducted in 2013. According to Dan Stone, the chain's chief business and people development of- ficer, that research showed there were barriers to consumers visiting The Melting Pot. Specifically, the barriers involved the expense, time commitment and self-service nature of a full fondue meal. At the same time, research showed guests wanted the chain to remain a place for special occasions. "[Offering experiences] can be a double-edged sword because if you leverage that too much, then some people view you as that thing you do once in a while," says Stone. "With the evolution, I want people to use us for that special occasion and to choose to use us in different ways and come and visit us more." Overcoming the barriers customers cited in the chain's research was largely (though not exclusively) a matter for the menu. For decades, says Stone, it was simply not possible to get a non-fondue meal at The Melting Pot. The chain, then, introduced new options that are cheaper, quicker and don't require guest participation. These include paninis and entree salads offered at price points that make them realistic for lunch or a non-occasion meal. Notably, Experience-Based Dining, Elevated THIS FONDUE CONCEPT HAS REWORKED ITS MENU AND DESIGN TO ENHANCE GUEST EXPERIENCES. Peninsula tables at the bar and cubbies showcasing specialty cocktails are part of the bar enhancements that make The Melting Pot more appealing to everyday guests. DSR of the Month: Vincent Chhim, Sales Manager, Rose's Equpment, Portland, Ore.